Finally here is the anticipated Grand Opening of the new MajuHome Concept store at Citta Mall. Hey remember last month we had a sneak peak and blogged about the MajuHome Concept Snap and Win Contest. And we were back again for their exclusive style filled with glitz and glamour grand opening celebration. Plus the official reveal and signing ceremony of MajuHome Concept with former Formula One racer, Alex Yoong, appointing the later as the new brand ambassador for the MajuHome Concept brand. The event kicked start with the opening speech by Ken Low, MajuHome Concept group Managing Director. The company has already been in business since 1986, and over the period of 30 years, the company has continue to surf to new frontier and evolve with times. MajuHome Concept is now a “one stop shopping experience” for everyone who is looking modern and contemporary furniture and lifestyle concept store. There are a wide variety of modern and trendy furniture with latest designs for everyone at an reasonable price. Plus don’t miss out their grand opening sales from 2nd to 5th June. After the ribbon cutting ceremony was the prize giving to all the winners of MajuHome Snap and Win Photo Contest. Then followed by the vibrant and energetic Lion Dance to mark this auspicious day. Then we had a tour around the whole store before the official signing ceremony of MajuHome Concept with former Formula One racer, Alex Yoong, as the new brand ambassador for the MajuHome Concept brand. The new MajuHome Concept at Citta Mall is a double storey massive selling and floor space of approximately 60,000 square feet. They are now Citta Mall’s biggest anchor tenant and the biggest in home furnishing and lifestyle products. At MajuHome Concept you can find a wide range of home living products ranging from sofa to dining furniture as well as a diverse variety of branded bedding products, the new stylish and contemporary gallery also features tasteful home decorative accessories, unique children specialty furniture, in demand office furniture collection and high quality built-in kitchen cabinets, kitchen and bathroom appliances. Standing strong to their slogan “Redefining Lifestyle, Your Way” at MajuHome Concept they believe that delivering good quality furniture solutions that suits every room and space of customer’s home and office but also modern, contemporary and trendy furniture that redefines a personal taste and lifestyle in his or her unique way because every person’s taste and style is unique and special. 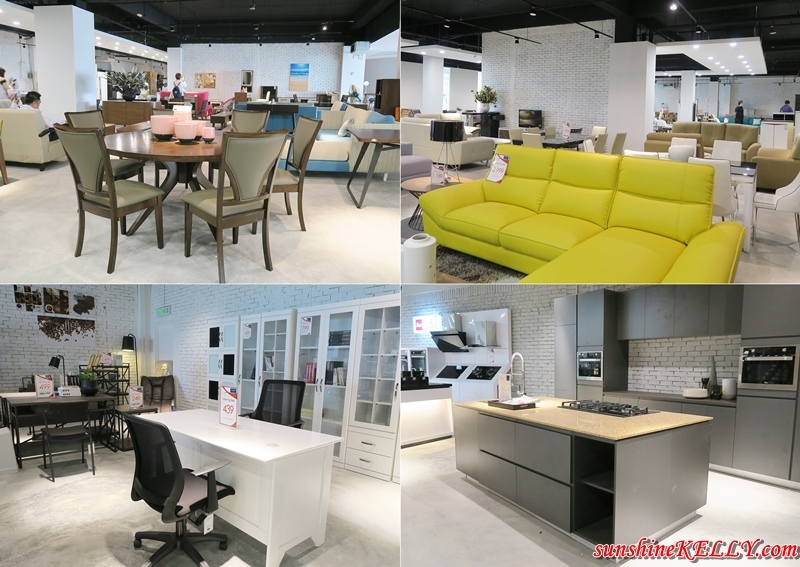 After the tour, we witnessed the revealing and signing ceremony of MajuHome Concept with former Formula One racer, Alex Yoong, appointing the later as the new brand ambassador for the MajuHome Concept brand. Basically, if you are looking for furniture, fittings, kitchen and bathroom MajuHome Concept store is the one stop solution and also “one stop shopping experience” for you. No more headache and time wasted hunting for the furniture and kitchen when before you move into your new home. Oh ya! for those Muslim friends I am sure some of you might want to upgrade, change or buy new set of sofa, dining or furniture do dropby MajuHome Concept store. The brand new MajuHome Concept store at Citta Mall are now officially open and there are plenty of exciting promotions and activities lined up to reward loyal and new customers alike in the new opening weekend such as the fabulous lucky draw activity which will be giving away a total of more than RM10,000 of products and prizes. Don’t miss out all the fabulous offers and great bargains. For more information about MajuHome Concept @ Citta Mall, please visit MajuHome Concept Facebook Page or visit their stores. Very nice place to stay in.. Beautiful and nice.. Great home-y concept! I love the furniture at Majuhome because they look very sleek, elegant and yet really cozy. Are the furniture sourced locally? I love to visit there. so much choices and is suitable for the whole family. I love window shopping at home concept stores like MajuHome. I need them to be in Ipoh!! those furnitures really look great.. I wish I can own one or two of these... very modern and nice... I need a new sofa..
Couldn't decide which furniture i wanted to get because all of them looks so good! Wow! It looks amazing there and I'm seeing furniture that I would love to have in my own home. I love going into furniture stores and checking out how to redecorate.